Theme Manager allows you to easily manage customizations for individual categories in JReviews, including the listing detail pages. 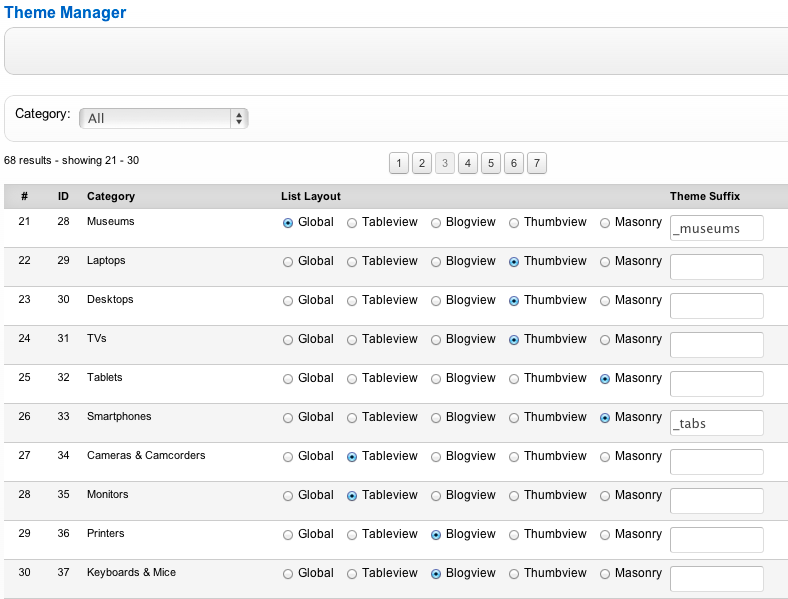 The Theme Manager displays a list of all categories, allowing you to select a different layout (Tableview, Blogview, Thumbview or Masonry) and assign theme file suffixes for each of them. Theme suffixes are explained in more detail below. For any given page, except for search results, the category theme setup is checked first, then the global setting (List page tab in configuration settings). When a suffix is assigned (i.e. _museums), you can copy and rename any view/css file to use that suffix. If the file is found, it will be used, otherwise the default view/css files are used. /listings/detail_museums.thtml - modified file that will be used only for listings that belong to the Museums category. You can also have different theme files for JReviews Menu items and Modules. For the Menu Items, you can specify different theme suffix in the menu item's preferences. For the Modules, you can specify different theme suffix in the module's preferences.